The Canadian Shield is a broad region of Precambrian rock (pictured in shades of red) that encircles Hudson Bay. It spans eastern, northeastern, and east-central Canada and the upper midwestern United States. The Canadian Shield, also called the Laurentian Plateau, or Bouclier canadien (French), is a large area of exposed Precambrian igneous and high-grade metamorphic rocks ( geological shield) that forms the ancient geological core of the North American continent ( the North American Craton or Laurentia). Composed of igneous rock resulting from its long volcanic history, the area is covered by a thin layer of soil. With a deep, common, joined bedrock region in eastern and central Canada, it stretches north from the Great Lakes to the Arctic Ocean, covering over half of Canada; it also extends south into the northern reaches of the United States. Human population is sparse, and industrial development is minimal,  while mining is prevalent. 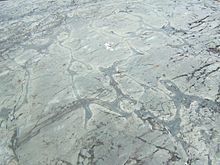 The Canadian Shield is a collage of Archean plates and accreted juvenile arc terranes and sedimentary basins of the Proterozoic Eon that were progressively amalgamated during the interval 2.45 to 1.24 Ga, with the most substantial growth period occurring during the Trans-Hudson orogeny, between ca. 1.90 to 1.80 Ga. The Canadian Shield was the first part of North America to be permanently elevated above sea level and has remained almost wholly untouched by successive encroachments of the sea upon the continent. It is the Earth's greatest area of exposed Archean rock. The metamorphic base rocks are mostly from the Precambrian (between 4.5 billion and 540 million years ago) and have been repeatedly uplifted and eroded. Today it consists largely of an area of low relief 300 to 610 m (980 to 2,000 ft) above sea level with a few monadnocks and low mountain ranges (including the Torngat and Laurentian Mountains) probably eroded from the plateau during the Cenozoic Era. During the Pleistocene Epoch, continental ice sheets depressed the land surface creating Hudson Bay, scooped out thousands of lake basins, and carried away much of the region's soil. When the Greenland section is included, the Shield is approximately circular, bounded on the northeast by the northeast edge of Greenland, with Hudson Bay in the middle. It covers much of Greenland, Labrador, most of Quebec north of the St. Lawrence River, much of Ontario including northern sections of the Ontario Peninsula, the Adirondack Mountains  of New York, the northernmost part of Lower Michigan and all of Upper Michigan, northern Wisconsin, northeastern Minnesota, the central/northern portions of Manitoba away from Hudson Bay, northern Saskatchewan, a small portion of northeastern Alberta,  and the mainland northern Canadian territories to the east of a line extended north from the Saskatchewan/Alberta border ( Northwest Territories and Nunavut). In total, the exposed area of the Shield covers approximately 8,000,000 km2 (3,100,000 sq mi). The true extent of the Shield is greater still and stretches from the Western Cordillera in the west to the Appalachians in the east and as far south as Texas, but these regions are overlaid with much younger rocks and sediment. Panorama of Canadian Shield geography in the Flin Flon, Manitoba region. The lake in the background is Big Island Lake. Each belt probably grew by the coalescence of accumulations erupted from numerous vents, making the tally of volcanoes reach the hundreds. Many of Canada's major ore deposits are associated with Precambrian volcanoes. Mountains have deep roots and float on the denser mantle much like an iceberg at sea. As mountains erode, their roots rise and are eroded in turn. The rocks that now form the surface of the Shield were once far below the Earth's surface. The high pressures and temperatures at those depths provided ideal conditions for mineralization. Although these mountains are now heavily eroded, many large mountains still exist in Canada's far north called the Arctic Cordillera. This is a vast deeply dissected mountain range, stretching from northernmost Ellesmere Island to the northernmost tip of Labrador. The range's highest peak is Nunavut's Barbeau Peak at 2,616 metres (8,583 ft) above sea level. Precambrian rock is the major component of the bedrock. The North American craton is the bedrock forming the heart of the North American continent and the Canadian Shield is the largest exposed part of the craton's bedrock. The Canadian Shield is part of an ancient continent called Arctica, which was formed about 2.5 billion years ago during the Neoarchean era. It was split into Greenland, Laurentia, Scotland, and Siberia, and is now roughly situated in the Arctic around the current North Pole. The current surface expression of the Shield is one of very thin soil lying on top of the bedrock, with many bare outcrops. This arrangement was caused by severe glaciation during the ice age, which covered the Shield and scraped the rock clean. The lowlands of the Canadian Shield have a very dense soil that is not suitable for forestation; it also contains many marshes and bogs ( muskegs). The rest of the region has coarse soil that does not retain moisture well and is frozen with permafrost throughout the year. Forests are not as dense in the north. In northeastern Quebec, the giant Manicouagan Reservoir is the site of an extensive hydroelectric project (Manic-cinq, or Manic-5). This is one of the largest-known meteorite impact craters on Earth. The Shield, particularly the portion in the Northwest Territories, has recently been the site of several major diamond discoveries. The kimberlite pipes in which the diamonds are found are closely associated with cratons, which provide the deep lithospheric mantle required to stabilize diamond as a mineral. The kimberlite eruptions then bring the diamonds from over 150 kilometres (93 mi) depth to the surface. The Ekati and Diavik mines are actively mining kimberlite diamonds. ^ a b The Atlas of Canada. "Physiographic Regions Map" (JP2). Natural Resources Canada. Retrieved 2017-08-01. ^ a b Encyclopædia Britannica. "Canadian Shield". Archived from the original on 2015-06-24. Retrieved 2009-02-10. ^ Stephen Marshak. Essentials of Geology. 3rd ed. ^ " Canadian Shield Archived 2006-08-21 at the Wayback Machine" in Columbia Encyclopedia. 6th ed., 2005. ^ James-Abra, Erin. "Canadian Shield". Canadian Encyclopedia. Archived from the original on 11 January 2018. Retrieved 24 January 2018. ^ Corrigan, D. (2008). "Metallogeny and Tectonic Evolution of the Trans-Hudson Orogen" (PDF). Archived from the original (PDF) on April 9, 2008. Retrieved 2008-03-05. ^ Peterson Field Guide to Geology of Eastern North America by Roberts, David & Roger Tory Peterson. ^ Clark, Bruce W. (1999). "Geologic History". Making Connections: Canada's geography. Scarborough, Ontario: Prentice Hall Ginn Canada. p. 95. ISBN 978-0-13-012635-1. ^ Pilkington, Mark; Roest, Walter R. (1998). "Removing varying directional trends in aeromagnetic data". Geophysics. 63 (2): 446–453. Bibcode: 1998Geop...63..446P. doi: 10.1190/1.1444345. ^ World Wildlife Fund, ed. (2001). "Northern Canadian Shield taiga". WildWorld Ecoregion Profile. National Geographic Society. Archived from the original on 2010-03-08. ^ Norris, Jessica (2007). "Report on the 2007 Diamond Drilling Program McClarty Lake Project, Manitoba" (PDF). Aurora Geosciences Ltd. Archived from the original (PDF) on 2008-05-30. Retrieved 2008-02-22.